Elon Musk sees sustainable cities on Mars within the next 50 years. And he expects to travel even farther into the solar system. The fine folks at Zero Hedge cast their reliably cynical gaze toward the 67th annual International Astronautical Congress in Guadalajara, Mexico, yesterday, with Elon Musk’s presentation on the colonization of Mars squarely in the cross hairs. “Musk has been successful is in the way he characterizes huge problems,” writes nom de site Tyler Durden, “and the ability to address them. Need an atmosphere? Yes, we can adjust that. Need it warmer? We can warm the planet, just like we have Earth. Musk, a man of rare ambition and considerable ego, is an easy target for even the idealistic among us, given the recent struggles of his Earth-bound enterprises. His deal to combine electric car maker Tesla Motors Inc. (TSLA) with rooftop solar panel maker SolarCity Corp. — (SCTY) – two money-losing companies — has not been received well in the financial world. Tesla stock is down 12.2% since terms of the $2.6 billion deal were agreed on August 1, 2016, 2016, while SolarCity is off 24.6%. Tesla’s production goals are highly questionable, and SolarCity’s most recent maneuvers include layoffs and other cost-cutting steps. And Musk’s Space Exploration Technologies Corp. (SpaceX) just saw its Falcon 9 two-stage rocket blow up on the launch pad at Cape Canaveral four weeks ago. As Zero Hedge points out — and as also stands to astrophysical reason — when the dying sun consumes Earth, it will also devour Mars. So colonizing the Red Planet is no panacea when it comes to extending humanity’s existence beyond the life of the Blue Marble. SpaceX continues to make real, tangible progress. The company “just achieved first firing of the Raptor interplanetary transport engine” three days ago, on Monday, September 26. The proper way to understand Elon Musk is not as a CEO, a financier or even an entrepreneur. As SpaceX founding team member Jim Cantrell explained for Forbes, he’s an engineer. As much wonderful vision as Musk has provided, NASA continues to do some halfway-decent things as far as space exploration is concerned. Its deep-space rocket is actually ahead of Musk’s. NASA fired its Space Launch System (SLS), which incorporates four RS-25 rockets in its core stage, for 500 seconds back on March 10, 2016. SLS too will take astronauts to deep-space destinations, including asteroids, Mars and other planetary systems. Aerojet Rocketdyne, formerly known as GenCorp Inc., is a $1.34 billion company with long-standing ties to NASA. It’s been in the aerospace industry since 1945, when predecessor General Tire & Rubber Co. acquired Aerojet Engineering Corp. The company reported second-quarter net sales of $408.4 million and net income of $5.9 million, or $0.09 per share. It enjoys a funded backlog of $2.3 billion. Aerojet was in on the action when NASA launched Apollo 11 and landed men on the moon for the first time in 1969. And it’s going to be there when we take the interplanetary leap. 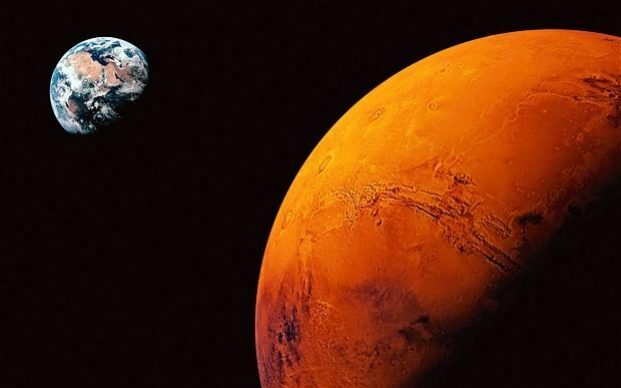 Will we live on Mars by the 2060s? Who knows? But without visionaries, there’s no innovation.